ww2dbaseCarl Frederick Holden was born in Bangor, Maine, United States. He graduated from the United States Naval Academy at Annapolis, Maryland, United States in 1917, and served aboard US Navy destroyers based in Queenstown, Ireland during WW1. In 1920, at the rank of lieutenant commander, he was given command of destroyer USS Mason. Beginning in 1922, at the US Naval Academy and Harvard University in Massachusetts, United States, he studied electrical communications engineering, acquiring a Master's Degree in 1924. In the late 1920s, he served in Brazil briefly. Between 1932 and 1934, he commanded destroyer USS Tarbell. Between 1935 and 1936, he served as the District Communications Officer at Pearl Harbor, US Territory of Hawaii. In the morning of 7 Dec 1941, while serving as executive officer of battleship Pennsylvania, Commander Holden coordinated anti-aircraft and damage control efforts as Japanese aircraft attacked his ship. In Jan 1942, he was made Fleet Communication Officer on the Staff of the Commander-in-Chief of the United States Fleet. In Sep 1942, he replaced Joseph Redman as Director of Naval Communications. In 1943, he was named the first commanding officer of battleship USS New Jersey. 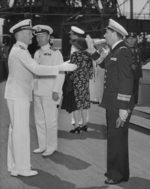 In 1945, he was promoted to the rank of rear admiral and was given command of Cruiser Division Pacific. On 2 Sep 1945, aboard USS Missouri, he witnessed the Japanese surrender in Tokyo Bay, Japan. After the war, he was made the Commander of US Naval Forces in occupied Germany; he remained in that position until his retirement in 1952 at the rank of vice admiral.